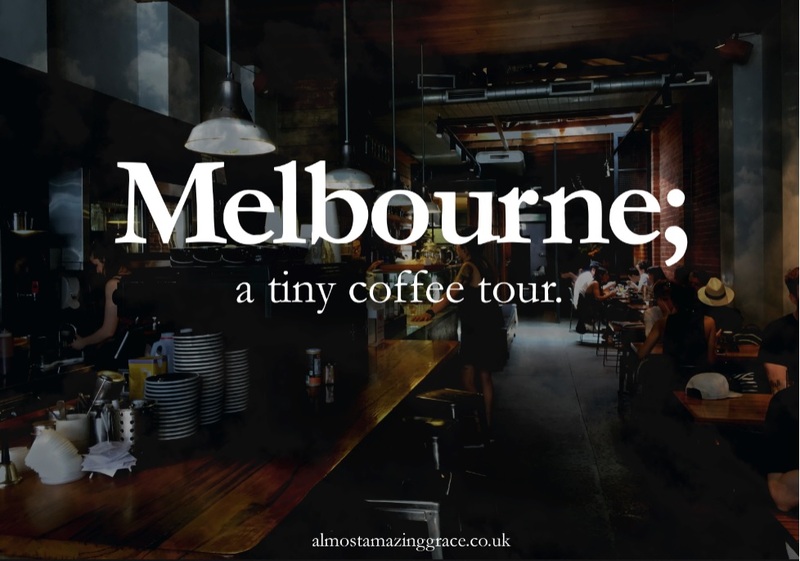 Melbourne; a tiny coffee tour. | Almost Amazing Grace. Melbourne; a tiny coffee tour. Now, I'm sure you're all aware of what a major coffee addict/connoisseur/snob I am. No? Well, where have you been?! To put it simply: I have grown up in a family of coffee lovers, in a house where there is almost an entire cupboard stuffed with canisters of different ground blends and several cafetieres in varying sizes, and mugs of every possible design. According to Mama - who is always keen to add this fun fact into conversation, often with complete strangers - my sister and I would accompany her to cafes most days in our prams, and she'd happily breast feed us between sips of her americanos. Wait, maybe that's why I'm so hooked on caffeine...?! Oh, god. Anyway, in my more recent years, I've been an award-winning barista in two of the UK's biggest chains. I never wanted to make a career of it, per se (I laughed in my manager's face when she suggested I progress to a Shift Leader role), but ever since I started making coffee behind the bar in the cinema where I worked at uni I became totally fascinated with the process - the art of it - as much as I was obsessed with the taste. I am meet up with friends all over the country in the quirkiest and best cafes - I can safely say I'd always rather meet for a coffee than a drink, or a meal. I'm always being tagged in Facebook posts about the deeply psychotic tendencies of coffee lovers, or tattoos of cups on Instagram. Coffee is my thing, and everyone knows it. I stopped in here for lunch (see this post for a photo of my many-layered super-green salad, dear god that was good) and couldn't say no when the friendly British waiter/barista suggested I have coffee with it. Coffee: quite bitter, but went well with my salad. I'd seen this place while walking up Chapel Street my first day in Prahran (two doors or so down from The Bearded Man - a place I thought was another cafe, turns out it was just a snazzy barber shop with a nice espresso machine and rainbow flags out front). It seemed like a big presence in the Melbs coffee world; it was almost always busy, every time I walked by, and the general 'look' of the place was OTT legit. Actually, a little intimidating. It's the only cafe in which I felt properly self conscious taking a photo of my cup. Coffee: perfect temperature upon serving (as many Aussie brews are, actually) and I gulped it down before it cooled too much. Pretty massive taste. Market Lane Cafe, Prahran Market. So, this was actually my first stop on my first day cafe-hopping; a rec from my Melbs-based friend. I was so entranced by the interiors and exteriors, it had the cutest outdoor benches and I kinda loved walking through the bustling veg and cheese market to get there. I stood for ages staring at the various different blends available, in bags to be bought - so long, in fact, that one of the baristas came over and offered to talk me through each option. I said yes, and geeked out inside as he did just that. Coffee: After hearing about the 5 different espressos the cafe used, I went with the barista's recommendation...the house standard. It was delicious - the best start to my day of adventures. Duke's Coffee Roasters, Flinders Lane. This name was scribbled in my diary after Cousin #1 said it was a must. The place was easy enough to find (after I got on the free tourist tram going the wrong way for 3 stops), and, as expected, rammed. The queue moved quickly though, and soon I was sat at the bar facing a mirror wall (a pet hate in cafes, tbh. Marks lost for that), drinking my second long black of the day. It was f*cking warm in there, I tell you what. Absolutely roasting - I ended up downing the coffee before I drowned in my own sweat. Coffee: short and surprisingly sweet...but packed a little punch. Of course, I did get coffee in between these spots that were high on my list, but not all of them were necessarily blog inspo or Instagrammable, I'm afraid. And that's it for Melbourne...this time, anyway. I must visit that gorgeous coffee-loving city again, someday. It's pretty high on my 'potential international someday homes' list. Btw, I've now made a new section on this blog for my coffee/cafe review-type things. Check it out, maybe? So far there are only 2 other posts under that header, but I am so excited to add more! Expect more Australian coffee posts soon...you've been warned.